The premise of the show is to teach woodworking to the viewer, and to make it accessible economically, and technically. No one should ever be intimidated, or afraid to try and learn because they don't have all of the bells and whistles. The idea is to have fun, be creative, and make great objects without breaking the bank. The show is humble, and that's the appeal. It has a sense of nostalgia to it that harkens back to bygone days when folks would roll up their dress shirt sleeves and work in their basement or garage workshops. The show airs Saturdays at 2 PM on WSBE, Rhode Island PBS. As a furniture maker, Steve Butler has been creating artwork for over twenty years. Born in Toronto, Canada, he began his career serving an apprenticeship in Peterborough, Ontario. After his apprenticeship he moved back to the Toronto area where he worked in various woodworking studios making furniture for others. As his passion for art and craft grew he pursued formal training at Sheridan College of Art and Design, majoring in furniture design. Graduating with honors, Steve then went to Queen’s University in Kingston, Ontario where he studied education. 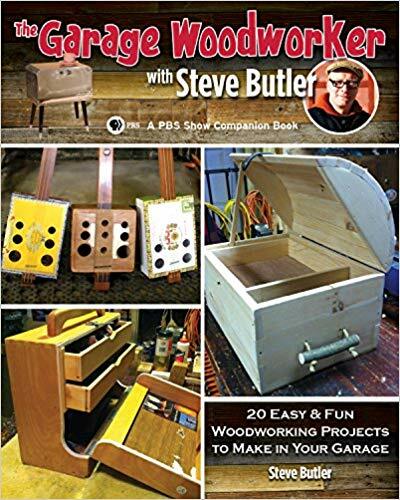 Steve is a former Department Head of the wood studio at Peters Valley Craft Center in Layton, NJ and at The Worcester Center for Crafts in Worcester, MA He exhibits his work throughout the US and Canada and has been featured in various magazines and publications such as Lark Book’s 500 Tables and 500 Chairs.